Today is an exciting day in the Flight of the Century workshop, where the electric Long-ESA is not only receiving propeller shaft design and fabrication, but we are developing the intriguing capability to regenerate electrical power during descents through our on-board Kinetic Energy Recovery System (KERS). Our liquid-cooled DC brushless electric motor is capable of 258 horsepower and 400 ft/lbs of torque…in both directions. 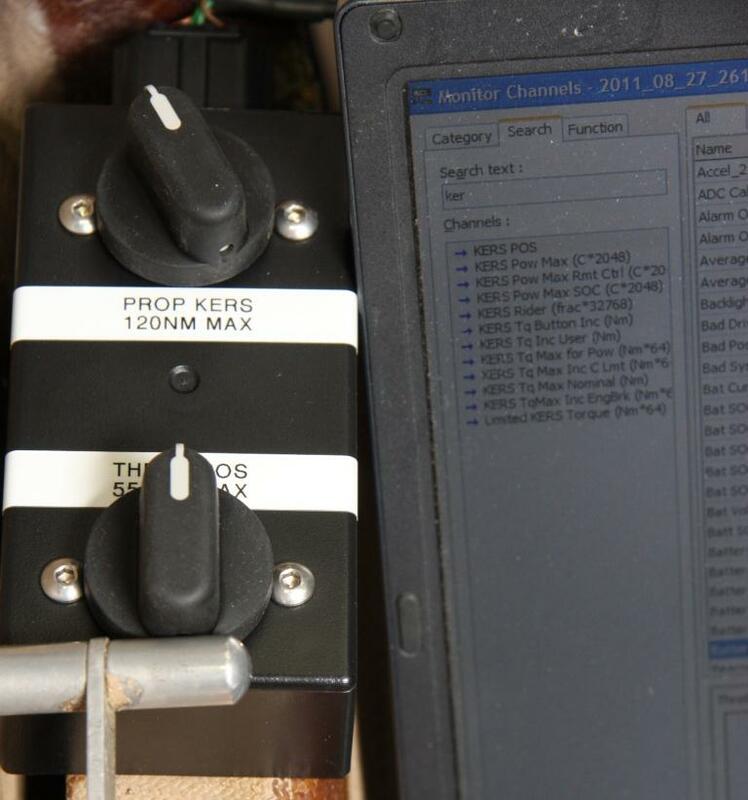 We have the ability to send regeneration commands to the motor controller over one of our two CAN networks in the plane. The motor can regenerate the same power as it can output, so we could send a command asking for 400 ft/lbs of torque to be regenerated by the otherwise freewheeling propeller. Of course, that amount of torque would stop the propeller dead in its tracks and generate nothing, so we are endeavoring to develop realistic KERS torque maps as part of our flight testing and high altitude missions. I want to fly higher than 30,000 feet, deplete my battery pack completely on the way up, and see how much I can recover on the way down! This is a potentially very interesting area of development that we want to stake a claim in as early developers. A descending electric plane could generate significant amounts of energy with proper control algorithms and tables in place. 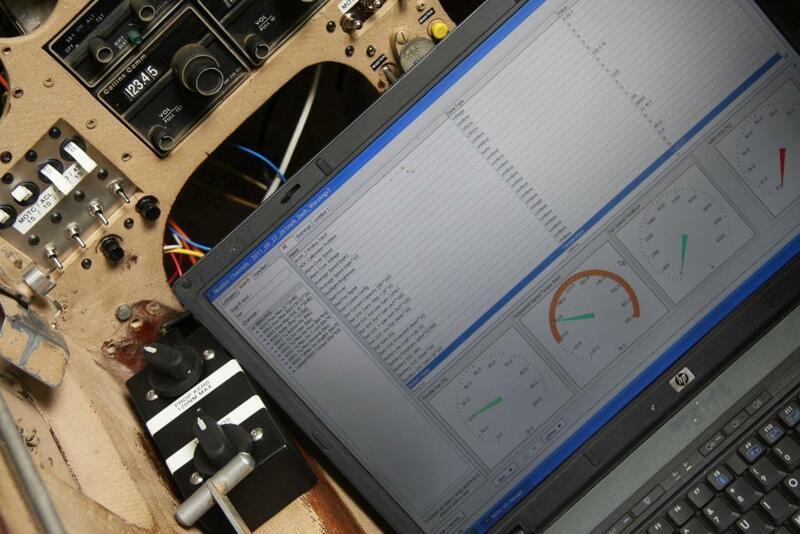 Our on-board electric motor control computer (ECU) allows us to run around 30 real-time maths channels and 30 real-time advanced maths channels. We currently use these to do real-time battery pack State of Charge (SOC) calculations and other high level functions during EV operation. 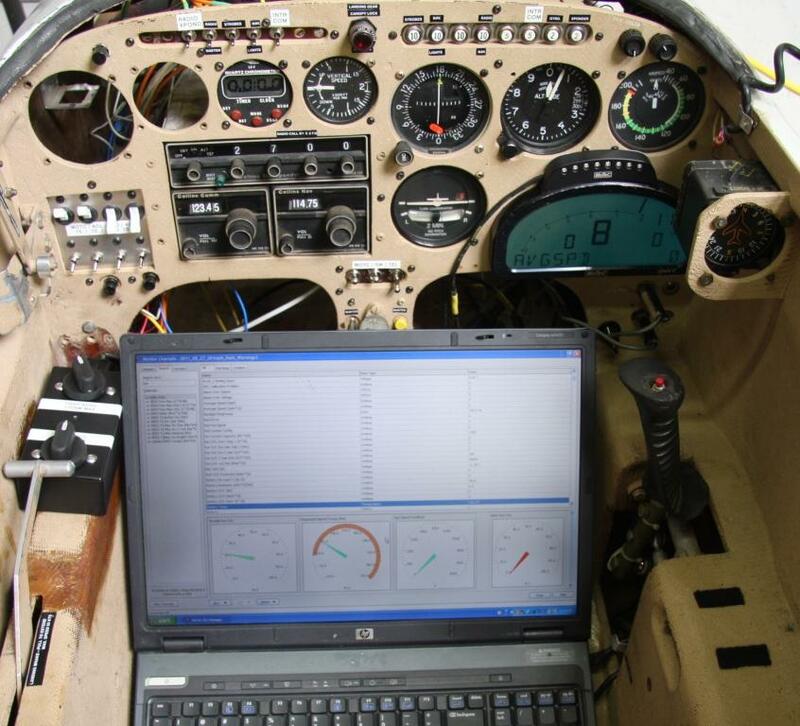 During flight testing, we will be creating and populating tables with data from our KERS descending tests that will tell us how much power can be recovered by a prop of known dimensions and performance without stopping the prop or causing excessive drag that creates a stall condition or pitch down attitude more than what the available elevator authority can compensate for. We want to determine what the ideal pitch angle of the aircraft is versus KERS regeneration command signals at differing energy recovery levels. We also want to plot these results against density altitude and other impacting weather phenomena including winds aloft. The result will be a set of data that we will be able to implement in our real-time software to automatically command a descent using aircraft pitch in conjunction with KERS commands to achieve an ideal balance of Vne, vertical descent speed, and energy recovery. This kind of testing and research is very exciting to all of us here at Flight of the Century and should provide meaningful results that others can use to help propel us into the future of long-range, electric flight. The images in the gallery above are from the throttle and KERS control installation and sensor calibration going on today and show the MoTeC display that talks to our ECU where we implement all our high level control algorithms. The laptop is talking over Ethernet to our ECU, which incidentally stores 1 Gig of data and right now we’re implementing around 150 channels of data on the plane. The black box is our electronic throttle and KERS control console that uses Denso 0-5v throttle position sensors to send commands to our ECU. 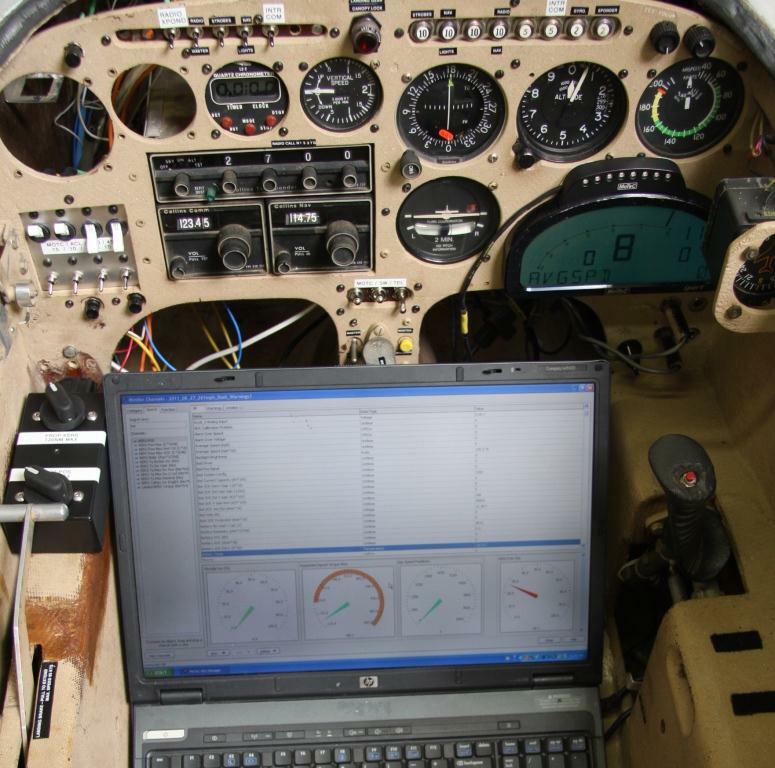 Notice the gauges in the MoTeC software on the laptop: the “Throttle Position” is of course 0-100% based on how much I twiddle the “go” knob! 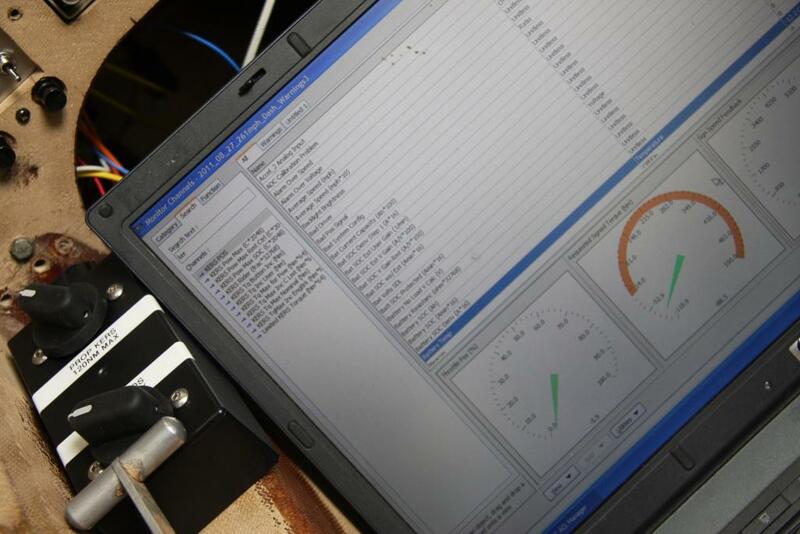 The “Requested Signed Torque” reads in newton-meters (not ft/lbs as I like to refer to all too frequently) and is based on the throttle position sensor output to the ECU that then runs through a number of our own tables and algorithms before arriving at the ultimate “Requested Signed Torque” value that is transmitted to the electric motor controller over CAN. 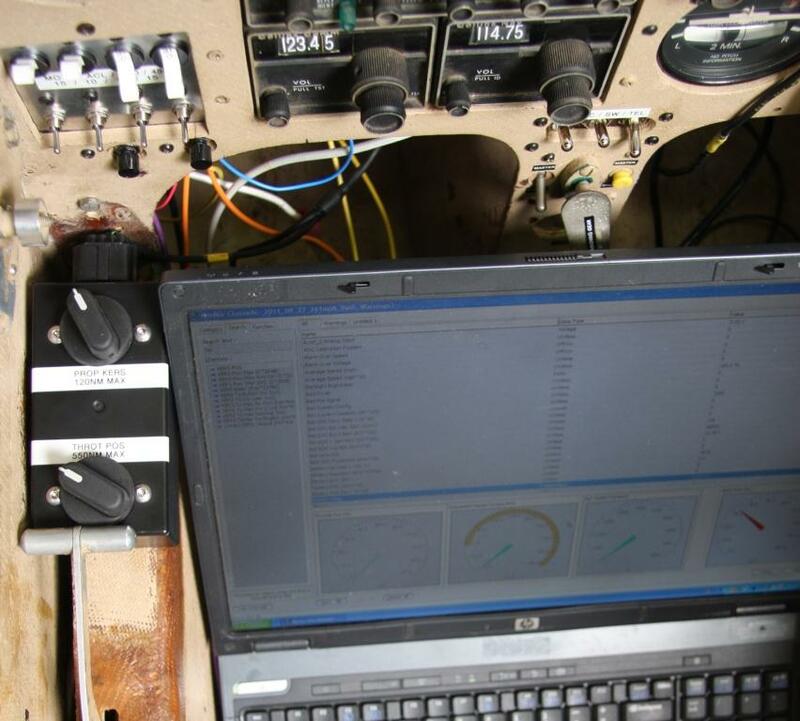 The “Sgn Speed Feedback” is the motor RPM being reported back to our ECU from the electric motor controller, and the “KERS Pos” is the 0-100% signal sent from our KERS position knob that’s also part of the black box on the pilot’s left side. We have a line of code that sums the Throttle and KERS position signals so if a throttle signal is sent and a KERS signal is also sent (if the KERS knob got bumped by accident for example), the ECU simply subtracts the KERS negative torque command from the throttle positive torque command to arrive at a slightly reduced but still positive torque command to the motor. The orange range of the “Requested Signed Torque” gauge represents positive torque commands being sent from the throttle. The range below the orange range represents negative torque commands sent by the KERS position sensor. As the KERS knob is increased, the needle drops to show increasingly more negative torque being commanded to the motor controller. Currently, we have the maximum amount of negative torque that the KERS position sensor could possibly send to the motor controller (ie 100% KERS command) as -120nm. On the throttle side, we have the maximum as 550nm of drive torque, which is the max for our motor (400 ft/lbs). In these images, the throttle position and KERS position sensors have not yet been calibrated, that was finished immediately afterwards, so now all the numbers match up perfectly! The images show the results of the throttle and KERS control knobs in different positions.